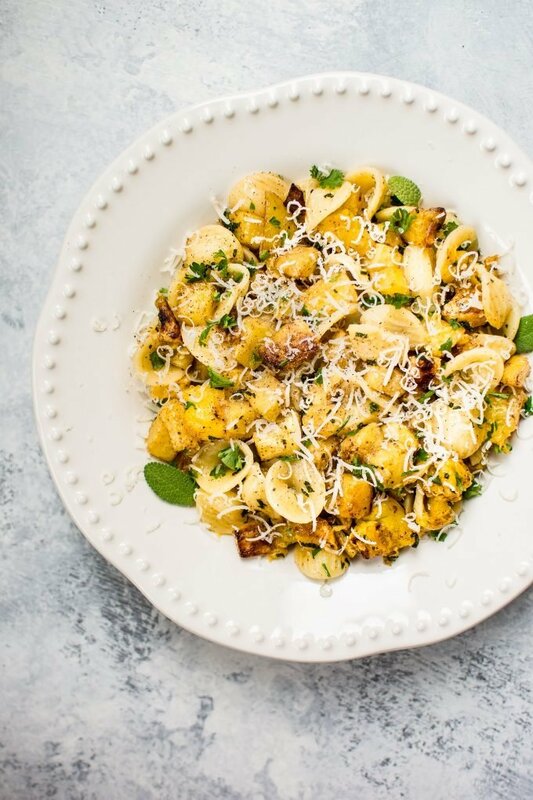 This roasted butternut squash pasta recipe is sure to become a favorite this fall! Butternut squash, warm spices, sage, and a brown butter sauce makes this easy pasta recipe a winner. I’ve gone down the sage and brown butter sauce routine once before on this blog with this mashed sweet potatoes recipe. It’s one of those well-loved combos that I wanted to explore further! This butternut squash orecchiette recipe really hits the spot. I can confirm that another human besides my husband (my sister) tested it, and she liked it. Did you know that orecchiette means “little ears”? It’s also really difficult to spell. I swear there was an orecchiette shortage in my city when I was shopping for ingredients for this vegetarian butternut squash pasta recipe. I ALWAYS see it in the pasta aisle, but of course the one time I actually needed it, it was nowhere to be found. I ended up going to like 4 grocery stores on a Friday night (insert random comment on how I need to get a life) until I finally tracked some down in an Italian specialty market. Geez. Sweet buttery goodness is what fall pasta recipes should be about, in my opinion. Total cozy comfort food! Enjoy! You may also like my honey roasted butternut squash recipe. Prep your butternut squash and add the pieces to a large baking sheet. Sprinkle the squash with the cinnamon, nutmeg, garlic powder, and salt & pepper. Add the olive oil and toss until everything is coated. Bake for 25-30 minutes, stirring halfway, or until the squash is cooked and lightly browned. When the squash is about done, melt the butter in a skillet over medium-high heat. Fry the sage for 2 minutes. Remove the pan from the heat. The sage will be crispy and the butter lightly browned (this is good - it adds a lovely nutty flavor to the dish). If you’re looking for more fall goodness, you may also like my acorn squash and carrot soup, my sausage stuffed squash recipe, or my spicy sweet potato soup. Isn’t that always the way it happens Natasha?! You see it all the time, then when you need it…none! And I love orecchiette too. Those little hats cradle the sauce so you get some with every bite! I love the warm spices, sage and brown butter here! Deliciously fall! So funny…. the life of a chef and hunting down the perfect combo of flavors. You had me at brown butter. This looks lovely. Totally!! Takes some trial and error haha. Thanks, Cindy! Such a comforting meal! I love the flavors in this dish! I am the biggest butternut squash fan, this looks incredible! Is there anything better than roasted butternut?! Butternut squash is my FAVE this time of the year. . LOVE this pasta! There are so many fabulous flavors here! How perfect for fall. I made this for a special New Year’s Eve dinner last night. DELICIOUS! And easy, too! This will definitely go into our regular rotation!